There are lots of reasons you might Torque the Wheel Nuts on your DB9, but its anytime you’ve had a wheel removed or perhaps you are getting ready for a track day and should double check they are properly torqued. I can tell you there is absolutely a wrong way to do it – just using an impact wrench and hammering them on until the gun stops turning. Read on to learn the right way. If you’ve had the wheel off the car, please check out the tips in my other video on Installing a Road Wheel. I think it’s easiest to torque the wheel nuts when the car is firmly on the ground so the wheels can’t spin. I’d suggest that you use the masking tape and put a wrap of it around the outside end of the socket where it could possibly touch the rims. This will help protect from scratching the rim. 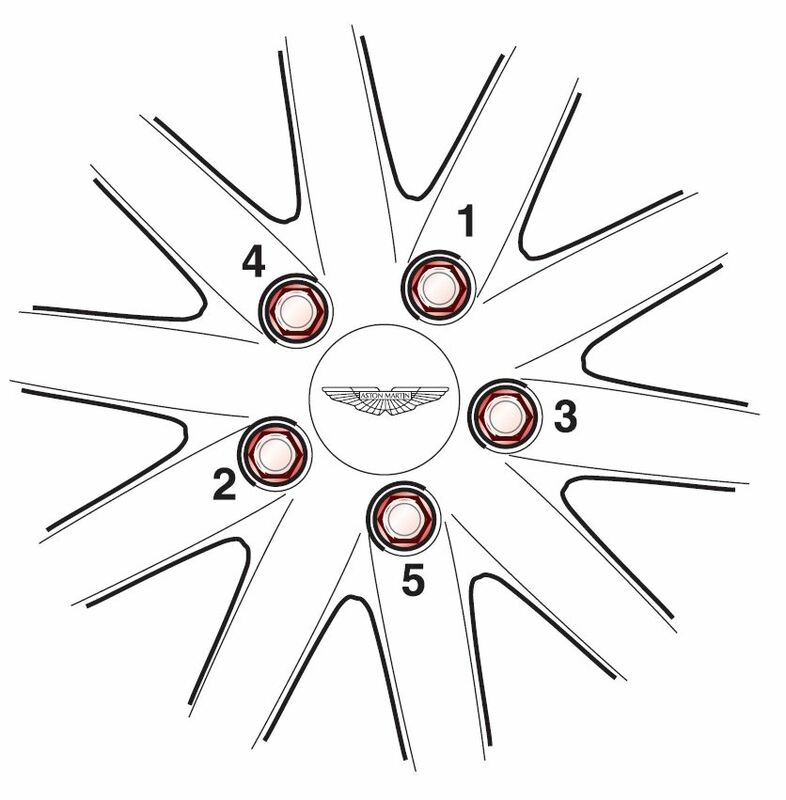 Aston Martin warns against tightening the wheel nuts with the wheels hot. For example don’t torque them right after a track day session. They will be over tightened when cooled, and could cause a failure. The order you should follow tightening the wheel nuts. You need to tighten them following a standard torqueing pattern for a five stud layout – which looks like crisscrossing a 5 point star. If you just tighten them in a circle its possible to misalign the wheel with the hub (bad mojo). Follow the pattern in the attached diagram (it’s easy). When tightening, do so in one smooth stroke until the torque wrench just clicks, then move onto the next wheel nut according to the torqueing pattern.